For decades, the Israeli-Palestinian conflict has defined and distorted the daily lives of millions of people. We have seen progress, we have seen setbacks, but now all we see is stagnation. For Palestinians and Israelis, the status quo is untenable. In order for members of both societies to live lives of opportunity, prosperity, and security, the Israeli occupation must end and a peaceful resolution to the conflict must be agreed upon and implemented. In today’s climate, it can be hard to envision an immediate resolution to the Israeli-Palestinian conflict—and that’s why it is more important than ever that supporters of a negotiated two-state solution step up and advocate vocally and visibly. 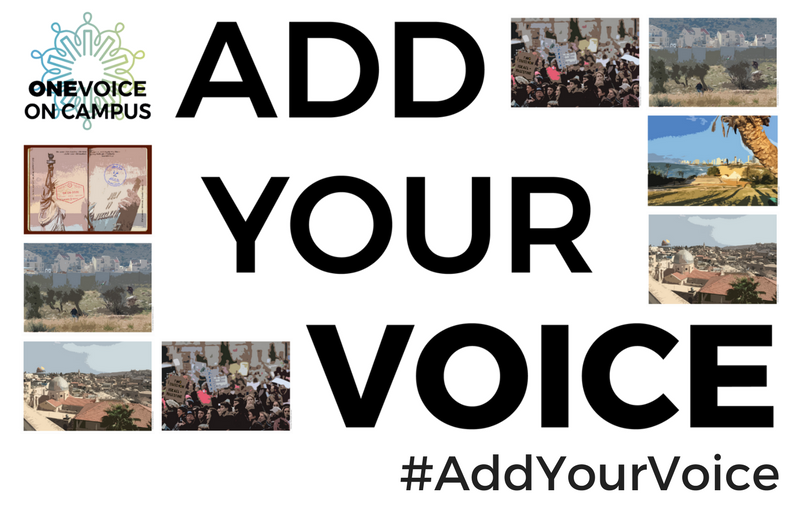 OneVoice on Campus invites you to make your voice heard, to add your voice to the global chorus of individuals who believe that a better future is possible for Israelis and Palestinians. Use the drop-down menu to select a postcard with a theme you feel passionately about. Fill in your information, which we'll use to ensure we're sending your postcard to your two senators and local congressional representative. Write to your representatives and tell them why you care about this issue. Feel free to use the text we’ve provided, or send a personal message. Tell them what motivates you to take a stand for a two-state solution. Tell them why you are adding your voice. 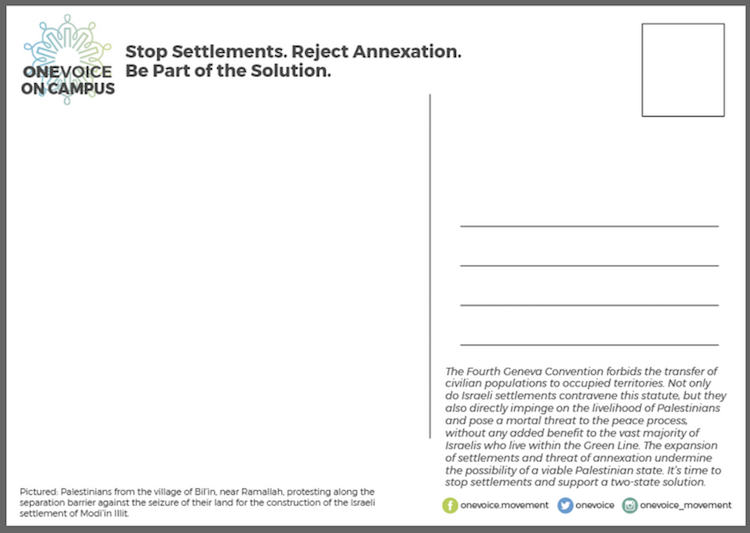 Stop Settlements.Reject Annexation.Be Part of the Solution. Jerusalem: The Key to a Lasting Peace. Palestinian Self-Determination: The Time for Two States is Now. Leaders on the Ground: Support Local Grassroots Movements. Israel at Peace and Secure: The Time for Two States is Now. The Fourth Geneva Convention forbids the transfer of civilian populations to occupied territories. Not only do Israeli settlemnts contravene this statue, but they also directly impinge on the livelihood of Palestinians and pose a mortal threat to the peace process, without any added benefit to the vast majority of Israelis who live within the Green Line. 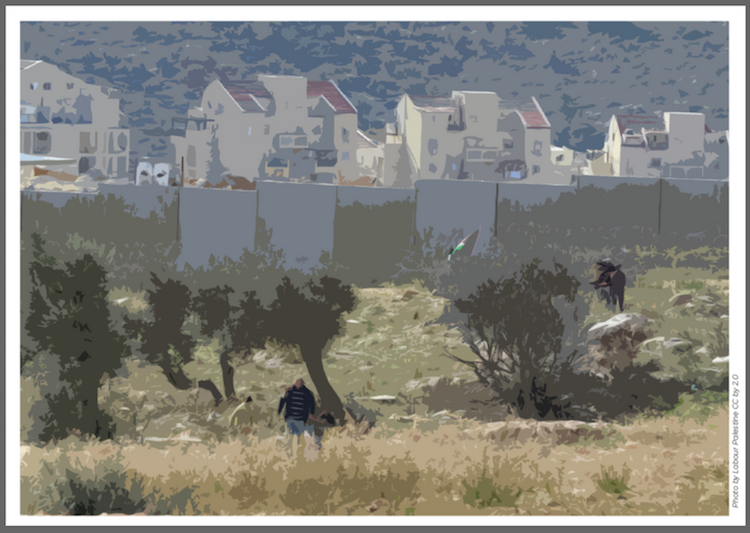 The expansion of settlements and threat of annexation undermine the possibility of a viable Palestinian state. It's time to stop settlements and support a two-state solution.